Efficiency Maine offers mail-in rebates and instant rebates on heat pump water heaters, and over 15,000 Mainers use them to heat their water. These units achieve greater efficiency than conventional electric models by drawing on room air to heat water. There is a $750 instant rebate available at participating distributors, making getting a heat pump water heater easier than ever. Simply ask your plumber or energy efficiency contractor about the instant discount — he or she will be able to purchase a discounted unit from a participating distributor. Units purchased without our instant rebate qualify for a $750 mail-in rebate. With the rebate, a heat pump water heater is similar in price to a traditional electric water heater. 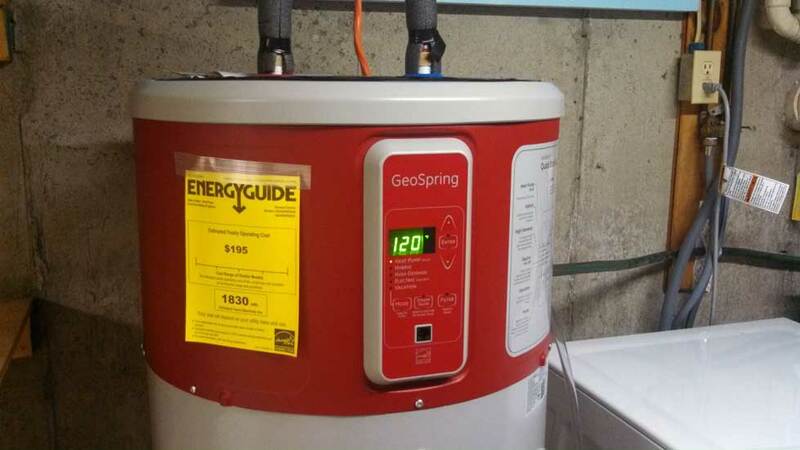 The savings continue over the life of the unit: ENERGY STAR estimates that a four-person household will realize more than $3,000 in savings over the projected 10-year life of a heat pump water heater. Heat pump water heaters are a great choice to use in an unheated space (like a basement area at least 10 feet square). They dehumidify and cool the surrounding air so they’re best placed in a basement rather than a living space. To learn more about heat pump water heaters, click here. There you can download a rebate form and learn about how your plumber may be able to access an instant rebate by purchasing a heat pump water heater at a participating distributor.